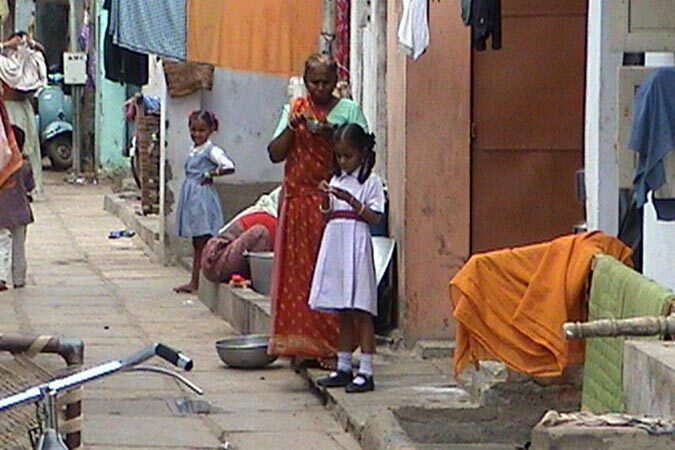 Nearly 41 per cent of the population of Ahmedabad resided in slums or chawls in the 1990s. Life in these areas was hard due to inaccessibility of basic amenities such as water, electricity, sanitation, drainage, etc. Though Ahmedabad Municipal Corporation (AMC) had introduced schemes for improvement in theseday-to-day necessities, it was rather difficult to implement them. An integrated approach of active partnership from the slum residents was required to address various basic facility related issues. When AMC initiated the Slum Networking Project in 1994, Saath joined hands for the integrated development. Saath was involved in the pilot phase of Sanjaynagar in collaboration with a private sector. The full-fledged Integrated Slum Development Project (ISDP) was then planned to implement in Guptanagar and Pravinnagar of Vasna. It began in May, 1998 with 1200 households and population of over 7000 dwellers. The approach and strategy were as follows: Rather than considering the residents as beneficiaries, they were made the partners in discussions and decision making.For expenses part, the three stakeholders, viz. AMC, private sector and the residents themselves, were equally involved. The total cost would be divided into three. One part would be spent by the AMC, one part by the company involved and the remaining one part would be borne by the household. The major components involved were separate connection for water supply, individual toilet, drainage system, pavement for internal roads, streetlight, landscaping, and facilities for solid waste management. Saath helped in facilitating payment and credit for the residents’ contribution for the project. The role of Saath was not only towards providing infrastructural facilities, it also looked into any other socio-economic aspects that came into the way of improving life. This included helping the residents with micro finances if they could not pay their part at one go. 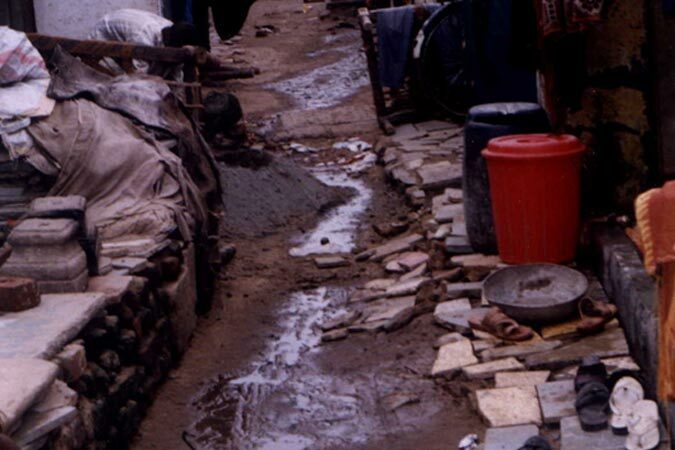 Due to poor living conditions, residents would often fall sick. Saath facilitated awareness about preventive healthcare. Apart from these, Saath’s role was significant in non-formal education, skill enhancement for income generation, formation of community associations, and many other softer aspects. The intervention lasted for three years and the projected ended in 2001. The impact has been measured based on the comparison of two socio-economic surveys carried out in 1997 and 2000. 97 per cent of slum households in Guptanagar and Pravinnagar participated in the project. This was possible after repeated community gatherings, listening to their grievances and generating awareness about their rights and responsibilities. Most of the households got separate water connection instead of limited shared connections earlier. This impacted greatly in the stress levels of women who used to spend hours waiting in the queue for water storage. As a result, women started using saved times in other income generating activities. The use of hand pumps, soak pits and private drainage completely stopped. Households got individual toilets and separate bathrooms and wash areas. There was an increase in the number of concretized roofs and bricked walls. Many households saw increase in number of rooms as well. There was notable improvement in the health of the residents, especially among girls and pregnant women. Significant increase was observed in adult literacy among women and children’s school enrolment. Additionally, there was a decrease in the rate of school dropouts. Due to improvements in micro environment, medical expenditures had gone down. Simultaneously, household income increased as women also started working in saved times. Owing to awareness, more people started taking up skilled and government jobs against casual and unskilled occupations. The lifestyle changes that were reported include increase in the use of cooking gas and consumer durables, metered electricity connections, and membership to other organizations such as Sakhi Mahila Mandal for savings. Increase in self-respect and self-esteem among the residents could definitely be attributed to the lifestyle improvements. NGOs had played a very crucial role in mobilizing and motivating communities confirming the significance of software components of the project.